A typical, relatively fit, person through pedaling motion can generate around 50 to 75W for a length of time (typically hours), or up to 700W for very short bursts (seconds) or 200-300W for short bursts (minutes). This is a useful amount of power, although generating energy at the same rate as the average human consumes it would not be practical through pedal generation. Example: The UK average person constant power consumption (due to all activities – heating, cooking, transport, manufacture etc) is around 4kW. This would require around 50 people constantly cycling (24hrs a day) just to supply the energy for one person…. Hence: always look at reducing consumption first. Pedaling is a very good way of giving people an interactive feel for levels of power and also brings in the concepts of power and energy. The level of power consumption of various devices is something that surprisingly few people have any feel for. Showing people that they could quite easily power a few energy saving light bulbs but would have a hard time powering one old incandescent light bulb gives a very real indication that one consumes less power than the other. 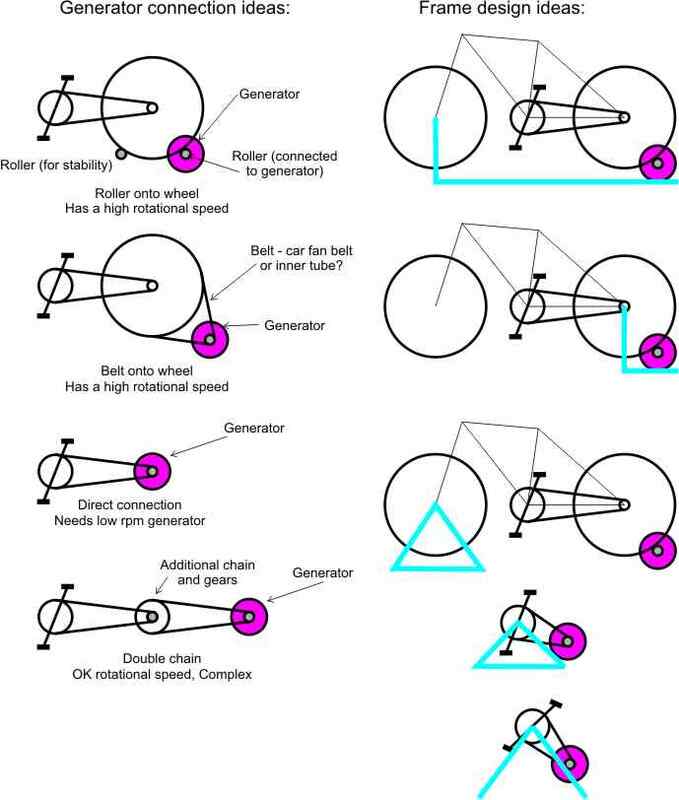 If possible the rotational motion of the pedal generator should be used directly (i.e. keep it mechanical). Any transfer of energy into different forms (i.e. mechanical to electrical) will incur some inefficiency disadvantage. Typical examples include pedal powered drills, sewing machines and numerous rice and corn mills used throughout the developing world. But there are benefits for generating electricity from a pedal generator and either using that energy directly or storing it for later use. Benefits include using various electrical devices (e.g. amplifiers, computers etc.) with which people are familiar and saving up power over a longer time to supply a higher powered device for a shorter time. This notes page has been written to look at electrical power production using pedal power; hence it will only cover electricity generation from now onwards. In order to convert the rotational mechanical motion into electrical power, some form of electrical generator is required. Generally an electrical generator is very similar to a motor, but with mechanical power supplied to generate electrical power, rather than vice versa. There are thousands of types of electrical generators available but very quickly we can see that the choice of easy to find generator for a pedal machine becomes limited. Firstly we are trying to generate low voltages. You could start generating high voltages but I don’t recommend if from a safety perspective. This stops us using all the various motors designed for plugging into the mains as generators. Its not just safety which stops us using these mains motors – they are designed to work with an AC voltage and they will not work as generators without an AC supply. Also, they usually have to be rotated at very high speeds which cause other problems on the mechanical side of things. Trust me. It’s a great big hassle. Due to the huge automotive market, there are numerous 12V DC devices along with some 24V DC devices. So why not use the generator from a car (an alternator)? There are a number of successful pedal generator designs which use car alternators. I have never had much luck with them. Car alternators are designed to run at a relatively fast rotational speed – around 2000 to 3000rpm. They also require some energy to supply a magnetic field in order for the generator to work; hence any generator must include a battery and some circuitry to supply the energy. Lastly, efficiency is not normally highest on the alternator manufacturers design list – cost is the most important. Hence some (not all though!) alternators are not very efficient. For these reasons I would not recommend using an alternator in the pedal generator designs. Typical rotational speeds of bicycle cranks are in the region of 60rpm. The highest gear ratio available on a typical bike is from 48 or 52 teeth to 12 teeth (a ratio of around 4). This allows maximum rotational speeds of around 250rpm of the bicycle wheel. In order to use this motion either a generator suited for around 250rpm is required or additional gearing is required. A number of designs use a small diameter roller which is spun by the bike tyre. This gives a very high step-up ratio (in the order of 26inch diameter : 1inch diameter = 26 times). In order to get over the low rotational speed problem, I have had luck using 24V DC machines. As voltage is directly proportional to rotational speed, at low speeds they will still give out a good high voltage, around 12V DC, which can recharge a battery. The best generator to use would be a low rotational speed permanent magnet generator. One problem with these has been that they were big – due to the size of the magnets required. Nowadays, with very powerful rare-earth magnets, these motors/generators are becoming easier to find. Also, specific low rpm generator could be built using strong magnets and, perhaps, the axial flux design, similar to Hugh Piggott’s wind turbine design. The most abundant form of pedal powered machine is the bicycle (the greatest invention of the previous millennium). Using mechanical parts from bicycles would be the easiest and cheapest to source. Some ideas are shown here, but infinite variations are possible. Once energy is available from the generator it needs to do something useful. This could either be direct to the device – sound systems and water pumps have both been used with success. One problem is to ensure that the voltage does not go too high. Perhaps using a car audio capacitor on the output wires of the generator. This would give a small buffer to smooth any fluctuations. Sometimes these have a built-in voltage display which would help the user modulate their pedaling. The energy could also be stored in a battery. Lead-acid batteries are used as they are cheap and ubiquitous. If the battery is purely for smoothing purposes then any ld battery can be used. If the battery is to efficiently store the energy for use at a later time, then a decent deep-cycle type battery should be used. To stop the generator working as a motor a diode, rated to the correct maximum current, should be used in the path from the generator to the battery. Be careful of correct polarity. Also put a fuse in this line, in case of any short circuit when the battery could potentially supply very large currents. A nice touch would be some form of monitor to see how much power is being generated. This could be measured to show each rider how much energy they generated. This could simply be some indicators dependent upon the current flowing, which would light up. Or it could be a more complex device which monitors the current and voltage and displays the exact power and cumulative energy. A shunt (low value resistor) would be required to measure the current flowing to the load.